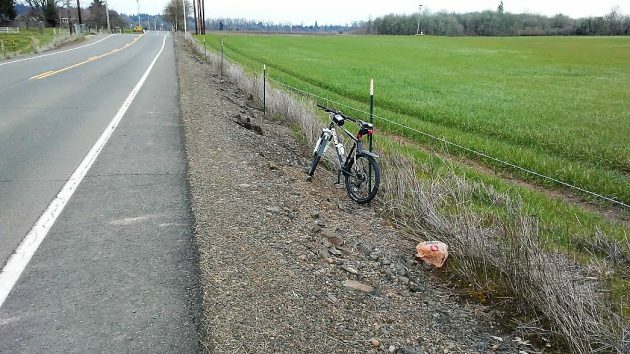 There it was, an ugly pimple on the face of the broad green bosom (in Tom McCall’s memorable phrase) of the Albany countryside: A discarded plastic grocery bag, limply pulsating in the breeze. 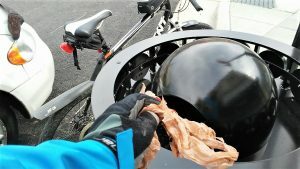 The bike and I were making our way along Bryant Drive when that bit of plastic trash caught my eye. Normally I would have gone on by. But this was a week after four middle schoolers from Memorial got up before the Albany City Council and asked for a ban on plastic bags. So this bit of debris fairly cried out to become a photo opportunity. It also reminded me to follow up on the request from the Memorial kids, members of the school’s “Green Team.” Is the council going to do anything about this, unlikely as it seems? Will plastic bags be on the council agenda any time soon? Alert now and on the lookout for plastic bags, I came across another one, though from a different store, under the railroad underpass of the Cox Creek Path. 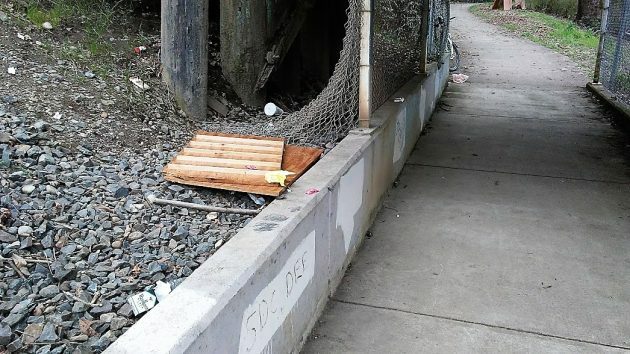 A lone plastic bag was the least of the problems at the Cox Creek railroad underpass. There will always be trash. You made the right call, Hasso: just stop and pick it up. As it’s been said…there will always be trash. Watching the garbage truck pick up my trash can and dumping it into his truck, garbage came out and on the ground. I picked it up later. Done! No need to pay the government .05 cents more for the privilege of using a plastic bag everytime I go out to shop. If you want a solution to all the blowing bags it’s simple and your not taxed for it……when your done using your bag, just tie the bag into a large double knot! It will stay where if falls and not blow in a tree at the first gust of wind. You may be responsible Larry, but a whole lot of people are not. Somebody has to clean this stuff up. And the problem is a lot worse than you think. Also nice to see that Johnny Horizon is still on the job. Watch this short video that was on the news a couple of days ago… Runs about a minute. Gee maybe we could get all theose environmentalists that pushed these bags on us in the late 80’s early 90’s and ruined the economy of a renewable resource that seems to be all the rage now……..TREES!!! Not having a plan and process for a great idea at the time of implementation….is a future headache in the making. Where’s the aspirin. Never experienced any enviro-pressure to do away with paper bags. The market dwindled because of cost. Bag-for-bag plastic won out for cost, storage space, and shipping cost. If there was any enviro-pressure, it was recycle content. At my place, margin wasn’t good to sort out the dynamics of the new product. Besides that, a southern fiber makes a better bag and grows fast enough to be farmed with a short cycle. One last point, it didn’t help that wood cost went up because harvest exceeded growth, exacerbated by a 20+ year gap in replanting. Is that a Mea Culpa? Or just an ask for a fresh redo? That “Take 2”. Either / Or …… I like it. Once something is in one’s head, it sure is hard to shake out. Those damn plastic bags will appear everywhere. I’ll pick up everyone I see! Promise. Well, I took two of them. And it was a follow-up. Pretty lame, but that’s all that came to me. As a corvallis resident who works in Linn I can say this: stop. This effects the poverty level more than you. This go green because yay green is all well and good, but it comes at a cost. In corvallis where we already pay 5 cents per bag, I asked (when the policy went into place) where the money went. It goes to the company. Not towards roads, schools, and law enforcement like it should, it simply helps Walmart’s bottom dollar, or Kroger’s(Fred Meyers parent company). It used to be the cost of doing business, it hasn’t generated jobs, or anything productive, and I can say they aren’t pushing new green projects because of it. Simply this: it hurts the poor, and the money doesn’t go to positive ends, simply someone’s bonus checks. I would love a ban on plastic bags. It is so easy to carry reusable bags. If you find it a pain to bring in your own bags then ask for paper bags in Albany, most of the stores have them. Target even has the paper bags with the handles which are really useful when re-used to take things to St. Vinnies. At the grocery stores, if you recycle your plastic bags, not just shopping bags, they are recycled to either make new bags or sometimes composite lumber. They do not end up in landfills. Look up “What happens to plastic grocery bags”.